Theoretical physicist Brian Greene is brilliant, charming, and silver-tongued. I’m guessing he’s the only Foundational Questions Institute grant awardee who also appears on the Pinterest Gorgeous Freaking Men page. Greene is the reigning spokesman for string theory, a theoretical framework proposing that one dimensional (also higher dimensions in later variants, e.g., “branes”) objects manifest different vibrational modes to make up all particles and forces of physics’ standard model. Though its proponents now discourage such usage, many call string theory the grand unification, the theory of everything. Since this includes gravity, string theorists also hold that string theory entails the elusive theory of quantum gravity. String theory has gotten a lot of press over the past few decades in theoretical physics and, through academic celebrities like Greene, in popular media. Several critics, some of whom once spent time in string theory research, regard it as not a theory at all. They see it as a mere formalism – a potential theory or family – very, very large family – of potential theories, all of which lack confirmable or falsifiable predictions. Lee Smolin, also brilliant, lacks some of Greene’s other attractions. Smolin is best known for his work in loop quantum gravity – roughly speaking, string theory’s main competitor. Smolin also had the admirable nerve to publicly state that, despite the Sokol hoax affair, sociologists have the right and duty to examine the practice of science. His sensibilities on that issue bring to bear on the practice of string theory. Columbia University’s Peter Woit, like Smolin, is a highly vocal critic of string theory. Like Greene and Smolin, Woit is wicked sharp, but Woit’s tongue is more venom than silver. His barefisted blog, Not Even Wrong, takes its name from a statement Rudolf Peierls claimed Wolfgang Pauli had made about some grossly flawed theory that made no testable predictions. The technical details of whether string theory is in fact a theory or whether string theorists have made testable predictions or can, in theory, ever make such predictions is great material that one could spend a few years reading full time. Start with the above mentioned authors and follow their references. Though my qualifications to comment are thin, it seems to me that string theory is at least in principle falsifiable, at least if you accept that failure to detect supersymmetry (required for strings) at the LHC or future accelerators over many attempts to do so. But for this post I’m more interested in a related topic that Woit often covers – not the content of string theory but its practice and its relationship to society. Regardless of whether it is a proper theory, through successful evangelism by the likes of Greene, string theory has gotten a grossly disproportionate amount of research funding. Is it the spoiled, attention-grabbing child of physics research? A spoiled child for several decades, says Woit – one that deliberately narrowed the research agenda to exclude rivals. What possibly better theory has never seen the light of day because its creator can’t get a university research position? Does string theory coerce and persuade by irrational methods and sleight of hand, as Feyerabend argued was Galileo’s style? Galileo happened to be right of course – at least on some major points. Since Galileo’s time, the practice of science and its relationship to government, industry, and academic institutions has changed greatly. Gentleman scientists like Priestly, Boyle, Dalton and Darwin are replaced by foundation-funded university research and narrowly focused corporate science. After Kuhn – or misusing Kuhn – sociologists of science in the 1980s and 90s tried to knock science from its privileged position on the grounds that all science is tainted with cultural values and prejudices. These attacks included claims of white male bias and echoes of Eisenhower’s warnings about the “military industrial complex.” String theory, since it holds no foreseeable military or industrial promise, would seem to have immunity from such charges of bias. I doubt Democrats like string more than Republicans. Yet, as seen by Smolin and Woit, in string theory, Kuhn’s “relevant community” became the mob (see Lakatos on Kuhn/mob) – or perhaps a religion not separated from the state. Smolin and Woit point to several cult aspects of the string theory community. They find it to be cohesive, monolithic and high-walled – hard both to enter and to leave. It is hierarchical; a few leaders control the direction of the field while its initiates aim to protect the leaders from dissenting views. There is an uncommon uniformity of views on open questions; and evidence is interpreted optimistically. On this view, string theorists yield to Bacon’s idols of the tribe, the cave, and the marketplace. Smolin cites the rarity of particle physicists outside of string theory to be invited to its conferences. In The Trouble with Physics, Smolin details a particular example of community cohesiveness unbecoming to science. Smolin says even he was, for much of two decades, sucked into the belief that string theory had been proved finite. Only when he sought citations for a historical comparison of approaches in particle physics he was writing did he find that what he and everyone else assumed to have been proved long ago had no basis. He questioned peers, finding that they too had ignored vigorous skepticism and merely gone with the flow. As Smolin tells it, everyone “knew” that Stanley Mandelstam (UC Berkeley) had proved string theory finite in its early days. Yet Mandelstam himself says he did not. I’m aware that there are other takes on the issue of finitude that may soften Smolin’s blow; but, in my view, his point on group cohesiveness and their indignation at being challenged still stand. Can a science department in a respected institution like Stanford in fairness be called a propaganda machine? See my take on Mark Jacobson’s science for my vote. We now have evidence that science can withstand religion. The question for this century might be whether science, in the purse sense, can withstand science in the corporate, institutional, and academic sense. 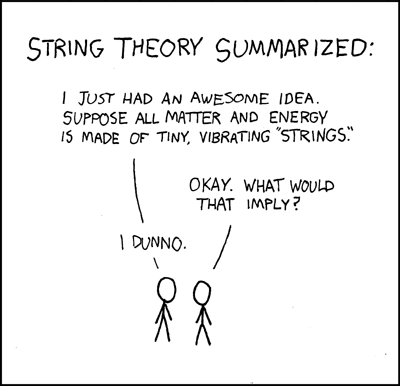 String theory cartoon courtesy of XKCD. “In many cases, estimating the prior is just guesswork, allowing subjective factors to creep into your calculations. You might be guessing the probability of something that–unlike cancer—does not even exist, such as strings, multiverses, inflation or God. You might then cite dubious evidence to support your dubious belief. In this way, Bayes’ theorem can promote pseudoscience and superstition as well as reason. This entry was posted on February 1, 2016, 1:01 am and is filed under History of Science, Philosophy of Science. You can follow any responses to this entry through RSS 2.0. You can leave a response, or trackback from your own site. Bill: Check out Nexus Quantum Gravitation – the latest theory of everything. For me it seems to make sense and answer all kinds of questions.